Our IPTV service may have just turned 3 years old (that’s 21 in dog years!) but we’re still keen to show you this dog’s got some new tricks. We’ve just announced some fantastic news about iiNet TV with Fetch including a change in the price and the addition of new content, but the biggest news for a lot of you is that the new Entertainment Plus Pack is available to more iiNet TV customers than ever before! After a lot of work behind the scenes we’re happy to say we’ve made it possible for an iiNet TV customer to add this pack and experience the full range of features available including everything that was available on the old entertainment pack as well as the new channels we’ve added thanks to a new method we’re using to get content to you called HLS. HLS: What is it and how does it work? HLS stands for HTTP live-streaming and is the name for a means of accessing a stream of music or video over the internet; it’s similar to other streaming methods but allows us to deliver IPTV services to all of our broadband customers and has a special twist in the way it works. In contrast to our previous method of providing IPTV (IP multicast), we break each video into bite-sized chunks of different sizes and resolutions; depending on how fast the active portion of the video you’re watching or recording is downloaded, HLS will choose the next portion of the video most suited to your connection so you can sit back, relax and enjoy all the features on offer without worrying the video is going to stop to load or buffer. This works similarly to how certain video sites such as Youtube will adjust the quality of the video while you watch so you always get the best quality without having to wait for it to load. You can test your connection on HLS with this handy page we’ve created under the section: Is my internet connection fast enough? Neat! Where can I learn more about this? I’m glad you (or I) asked! Our iiNet TV page has been given a big once-over with all the new information and more to give it that new-website smell. You can also check out our online and interactive iiNet TV experience to see just how it all will look in your own living room! Westnet customers can experience interactive TV on this website. If you’d like to sign up but have any questions not on our site, you can always give our friendly 24/7 sales team a call on 13 19 17. This is what I have been waiting for so long. entertainment plus is a wonderful package but what about world TV packages? They are still not available on my NBN because of multicast. Are you thinking of fixing that too? We definitely want to be able to provide the best services to all of our customers and are looking into providing the world TV packages through multicast to our NBN customers. Once we have more information about adding this feature we’ll be sure to post about it and let you all know it’s available. Will Fetch HLS be available over all internet technologies? Assuming its just a http live streaming service? I am in the process of applying for BDSL at the Lesmurdie exchange in Western Australia. We currently have multicast fetch, which is not compatible with BDSL due to the MER modulation. Could you confirm if HLS will be available over BDSL? Correct, the new Fetch through HLS should be possible on Bonded DSL services. Once the Bonded service is activated and connected, you’ll want to discuss having the IPTV service changed over to the new HLS service once migration is available. I am connected to the NBN and am very happy with the performance I receive. However,I am surprised that Fetch Tv is not available to customers who are connected to the NBN. The sales team has not been able to give an estimate of when this service may become available. I am disappointed in IInet’s NBN roll out as there does’nt appear to be the same range of understanding, services and bundling opportunites afforded to other users. I’ve confirmed with our engineers that IPTV through HLS is now available to our NBN customers. We’re working hard to get the migration process for existing IPTV users to HLS working as soon as possible and hope to have this ready early this month. Hi Tal, we’re off-net as we’re in the middle of the boonies and couldn’t previously access the Entertainment Plus option. Does this mean that we will be able to access it in the near future? Absolutely! We’re currently in the process of adding a means of switching from an existing IPTV service over to the new HLS and hope this will be ready early this month. Look out for further updates from us soon! Hi, I have a 2 story house and would like to have one Fetch box upstairs and one downstairs. When will it be possible to have 2 STBs connected to the one iiNet service? I can not even look to cnn or bbc a lot of times, because we are still on the old worn out copper lines here. They put in the plastic pipes under the ground, but no cable has been fed through . Let alone download anything from the net, not possible here. Mareeba is currently scheduled for the commencement of NBN construction within the next three years. With HLS it may still be possible for your line to support our IPTV service. We’ve got a handy Speed Test you can perform to check. How much does all this will cost me? iiNet TV with Fetch starts at $10 per month on a 24 month agreement. From there you can add our Entertainment Plus package for an additional $19.95 per month. More information about the packages, what they include and the full terms are available on our website (http://www.iinet.net.au/tv/fetchtv/getitnow/). If you have any further questions, you can contact our sales team any time on 13 19 17.
hi, I have currently got FTTH plan in Aurora estate epping north. Is IPTV available there ? 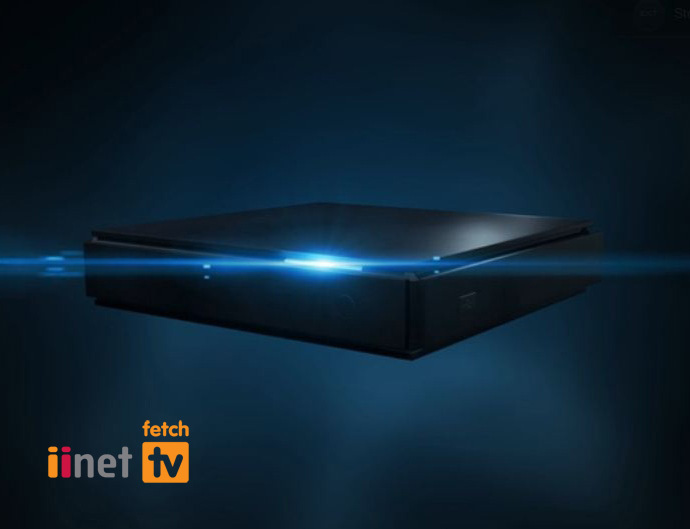 iiNet TV with Fetch is now available to customers on the NBN! Give our sales team a call on 13 19 17 and we can sign you up! Is the new Fetch TV available for iiNet Off-Net ADSL customers? Yes it is! Give our sales team a call on 13 19 17 and we’ll help in testing your connection and getting signed up. ABC Iview is now on Fetch TV GREAT NEWS! It is free to watch like on my PC or does it use up my quota? Right now iView via the IPTV service does count towards your quota, but we’re working on making it freezone as soon as possible. Will the world tv packages be available to off-net customers at any stage? We’re working hard to make all content packages available to customers on off-net HLS and will definitely announce once it’s available through our newsletter. You can subscribe for new developments and announcements through Toolbox. We’re working hard to provide World TV packages to all IPTV customers. At this point we don’t have an exact estimate on its arrival but will definitely announce its availability once it is. I am connected to Glenorchy Tas 7010 exchange. It is great news that entertainment package is available through the new technology. However I am waiting for the world tv package before I can switch over to fetch tv. I understand that u cannot give a date when the world package would be available through the HLS technology. However I would appreciate if you could advise me if and when the world tv packages are available through Hls technology, would these be available at the Glenorchy Tasmania 7010 exchange? I wish IINET could speed up the availability of world tv through HLS. I can understand where you’re coming from and that’s not a problem. We’ll be sure to announce the World TV packages availability over HLS here and over all of our social channels once it’s available. Howz going Tal? I am currently with Internode. As it is owned by IINET, I am assuming that when World TV is available on HLS, it would be simultaneously available on both IINET and Internode? The World TV package is, regrettably, not available on HLS. Sorry for the wording in the article that implied otherwise. The channels, at that stage, were still being organised. Hey iinet guys is there any news on HLS for World tv. Nothing yet I’m afraid. We’re presently working on providing access to IPTV channels on portable devices such as tablets and smartphones. We’re definitely aware of the demand for World TV on HLS though, and will work on bringing this to our customers as well. At this stage there is not, however this may change in the future. If anything does change, we will let all our customers know and, most likely, write a blog about it! Requesting internode to work on getting world channels on hls. Hi I have just started using my Fetch TV….loving it. Are yu able to stream live to Fetch directly from my computer (similar to how Apple TV or something similar)? You are able to use the IPTV box’s Media Hub function to browse files and play media from your PC on your TV! Check out the guide to getting started on our website. I checked with iinet and they have informed me that I canot get world package unless inet get them on hls. What is the time frame. Is iinet working on hls for world package? We’re still working hard to provide world TV packages on HLS. As soon as we have more information to provide we’ll be sure to announce it here and on our newsletter.